Lake homes in Georgia, bring forth you a fashionable living amid cool and calm natural environs of the lakeside. 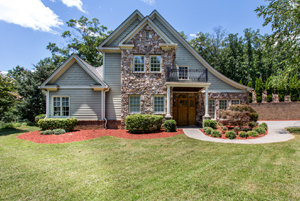 Located barely half an hour drive from Atlanta, the real estate has much to offer. Each home is designed with acute precision and extreme care has been taken to enable you to live a luxurious life. Why should you buy a house in Georgia? Investing in a Lake Home located in the beautiful environs of Georgia is extremely beneficial owing to the prime location it owns. The mesmeric place witnesses visits from tourists in large numbers every year, thanks to Lake Allatoona, the major center of attraction here. If you wish to spend vacation with family, enjoy a social gathering, the real estate in the village at waterside is an ideal choice. You may also enjoy recreational and refreshing activities right here, such as camping, fishing, picnicking, swimming, hunting, water sports and more. Each of the uniquely designed homes in the Lake House Georgia, has been inspired by the craftsman styles and French Country. The outer walls of several homes are beautifully decorated with brick & cedar shake exterior. As for the interiors, the classy Frenchman country has been the major inspiration. kitchens, all embellished with maple custom cabinets and granite counter tops, give an impressive appearance. Among other major attractions, most of the homes in this location offer spacious private patios, high rooftops, boat garages, vehicle garages and more. Several recreational facilities such as tennis course, miniature golf courses, and private swimming pools give you yet another reason to buy homes in this community and lead an exuberant life.